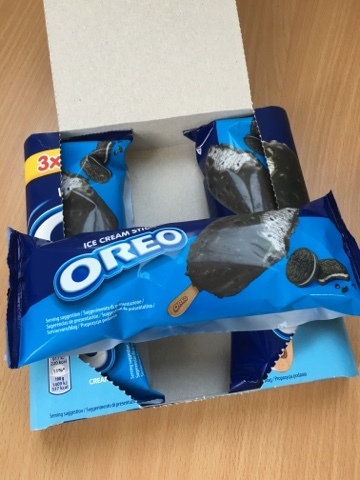 We've seen an awful lot of Oreo ice cream variations here at FoodStuffFinds over the years, as the American Bourbon biscuit has invaded these shores. This latest version is essentially an Oreo Magnum, but with an interesting twist. As you'd expect, nice clean branding, modern curvy box. Three well protected ice creams inside, even after the journey home. And inside we have your expected item - only the outside isn't chocolate. I'd assumed that this would be like a Pocky deluxe where the target brand is sprinkled on the outside of the standard choc. The coating is actually a biscuit with a very fine crumb! 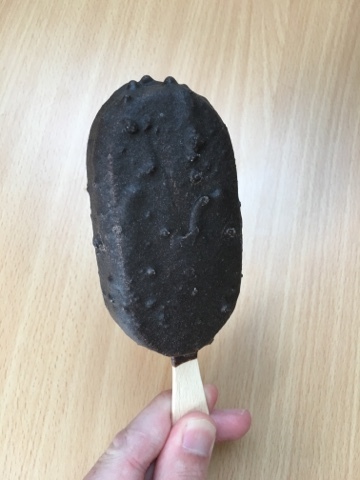 "Cream flavour ice cream with crushed chocolate flavour biscuit pieces with vanilla flavour filling, coated in crushed chocolate flavour biscuit with a vanilla flavour filling"
It also says 29% at the end but I'm not sure what that refers to. 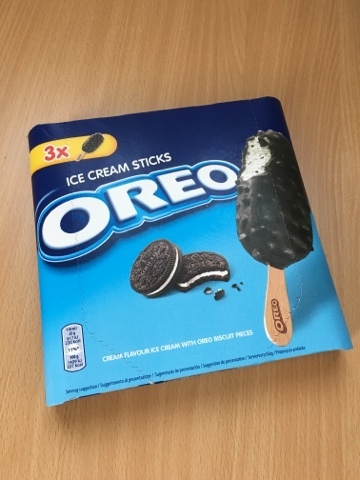 Essentially this means "ice cream mixed with Oreos, coated in Oreos" which is pretty novel. As readers will know I'm a sucker for unusual textures and this is certainly that. It's like a pudding on a stick. Amazingly the biscuit clings better than chocolate and there was little to no fallout from biting as it crumbles effortlessly. I don't think this will satisfy the chocoholics in your life, but if you know someone who likes the biscuits and wants a cold, ice cream packed version then this is ideal. They are currently on half price offer at UK Tescos too, which is why we picked them up for the office.